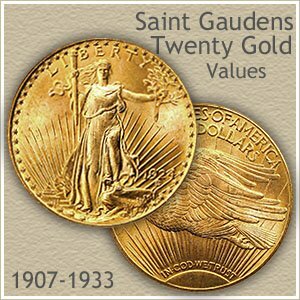 Saint Gaudens gold coin values have risen above $1,270 each. Containing nearly one ounce of gold, the price of the precious metal forms this high base value. Additionally, there are several rare dates and mint marks. For example, the 1908-S and 1925-S, when brought to auction, often trade for many thousands of dollars. The value chart highlights these rare coins. Also, collector demand for "Uncirculated" examples of this majestic coin help raise the value above the minimum. The St. Gaudens gold coin pictured, a lustrous coin, showing no signs of wear, is worth over $1,320 because of its condition. Determining your coin is in this state of preservation quickly moves Saint Gaudens gold coin values higher. Further down the page, how to evaluate condition is covered in more detail. Except for the rare dates, circulated and worn St. Gaudens are worth close to gold value. Reserving the best prices for Uncirculated gold. Examine your coins and the chart closely. 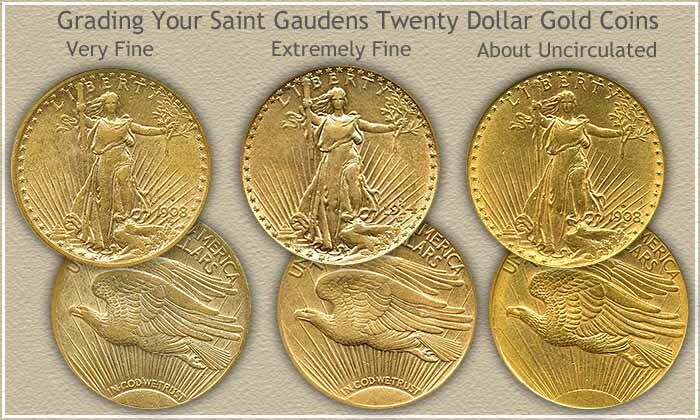 The above are wholesale Saint Gaudens gold coin values. Computed from dealer's price lists with various mark-up factors figured in. They reflect closely the value you would expect to receive when selling. Collectors and dealers avidly pursue gold coins, searching for ones in the finest condition. They evaluate each coin in a process known as "Grading." As a coin circulates through commerce it progresses through different stages of wear and loss of detail, each is assigned a grade. Most St. Gaudens gold is collected in the "Uncirculated" grade, accordingly these examples are worth a premium. Is your coin "Uncirculated," or slightly worn and in the "About Uncirculated" grade? Finding accurate Saint Gaudens gold coin values hinges on judging the difference. An Uncirculated coin shows no signs of wear and no break in the luster. Rotate your coin at different angles, under a light, the luster radiates out from the center, covering the entire surface. An About Uncirculated coin suffers from handling that quickly removes luster from the highest points of the design. This light wear has a slightly dull appearance. Compare your coins to the grading image. The distinction between Uncirculated and About Uncirculated is subtle. Because of the expertise required to grade accurately, and the different Saint Gaudens gold coin values from one grade to the next, most are submitted to a grading service. The prominence of NGC and PCGS within the collecting community is evident by touring a few sites. Check a few rare coin dealers' listings, look for those offering twenty dollar gold coins similar to yours. Their listings and prices include a notation of the NGC or PCGS assigned grade. Additionally, these coin dealers are potential buyers of your coins. Find the mintmark on the obverse, just above the date. Three different mints produced St. Gaudens gold and mint marks were place on coins by the branch mints to indicate origin. The Mint in Denver Colorado used a "D" mintmark, the San Francisco Mint in California used an "S". 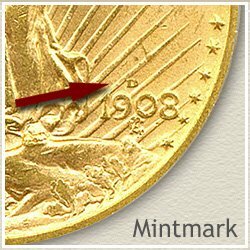 The main mint in Philadelphia Pennsylvania did not place a mintmark on coins. Examine your coins, as the mintmarked issues often have higher values. The popularity of the design drives Saint Gaudens gold coin values. This coin is always in demand by collectors. Handle your coin carefully by the edges to preserve its value. Find the value of all your gold coins. From the one dollar gold piece to the huge twenty dollar coin. Discover the rare dates and mints. All old US coin values. The home page is an excellent index, quickly leading to the major coin series. From Cents to Gold. 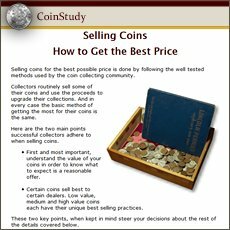 One of the greatest assets when selling coins is knowing their value. Print the Coin Values Worksheet - link in navigation column - to list your Saint Gaudens twenty dollar gold coins and record their values. Should you decide to sell... use the worksheet as an invoice and packing slip when sending coins through the mail to dealers. It indicates you have done your coin values homework, very important with today's high values.